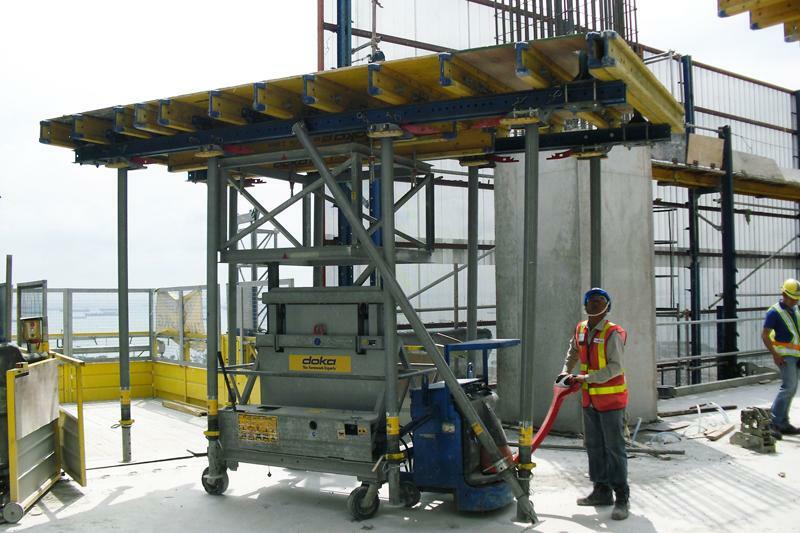 The combination of Dokamatic table and table lifting System TLS ensures a fast construction progress at the Marina Bay Financial Centre in Singapore. 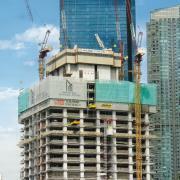 Swift, cost-optimised forming operations are a high priority in construction of the 230 m tall Tower 3 of Marina Bay Financial Centre, where just twelve months have been allowed for completion of all work on the structure shell. 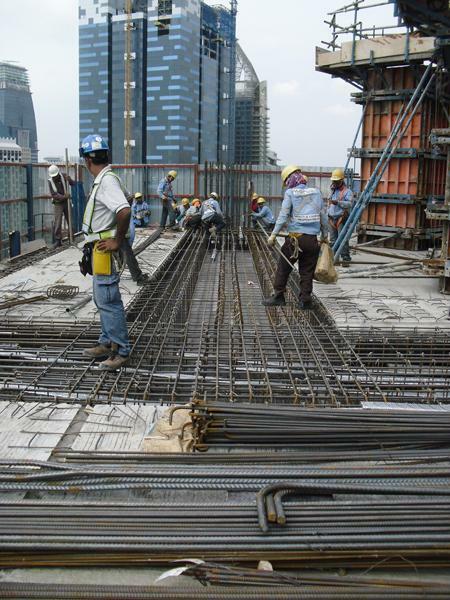 To construct an area of CIP concrete floor slabs totalling more than 140.000 m², the contracting JV of Kajima and Tiong Seng is relying on a cost-optimised formwork solution from Doka that is designed for maximum speed. Large-area Dokamatic tables, pre-assembled ready for operation, are in action here to ensure fast forming-times. 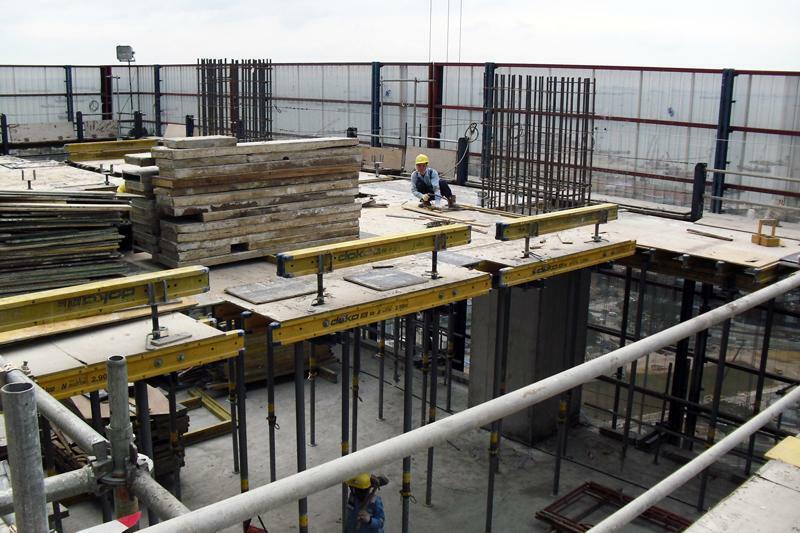 To speed up the slab-forming operations still further and permanently ease the pressure on the available craneage, the tableforms are moved around the storey levels on shifting trolleys fitted with attachable drive units, and moved up to the next storey level by two Doka Table Lifting Systems TLS. The advantages of these high-performing repositioning solutions speak for themselves: Using the shifting trolley means that instead of the usual team of up to five workers, it now only takes just one crew-member to transport the tableforms around each storey level. 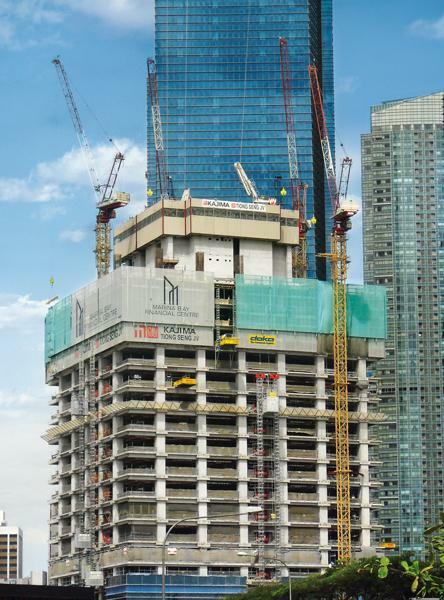 And on the Marina Bay Financial Centre build, moving the Dokamatic tables up to the next floor with the Doka Table Lifting System TLS is saving 131 crane cycles for each storey constructed – meaning nearly 5.000 fewer crane cycles on the project as a whole. The only time a crane is needed is for repositioning the TLS itself. 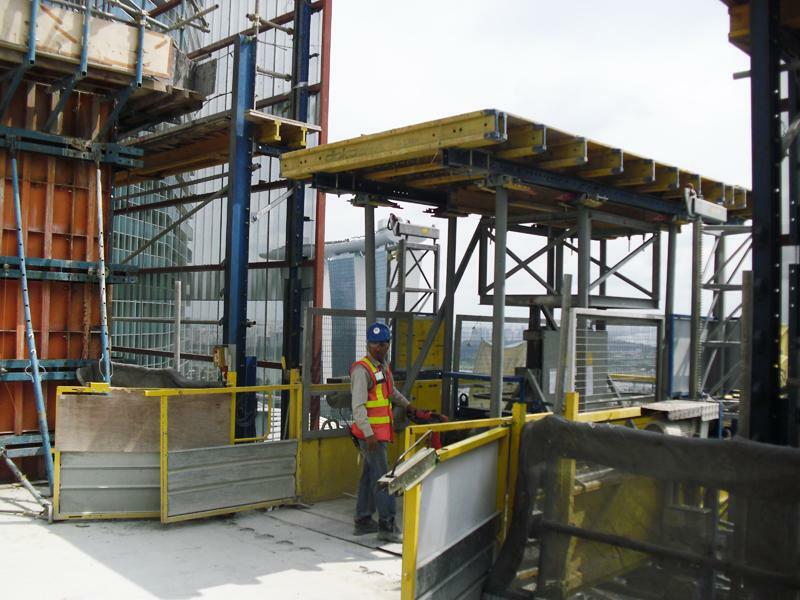 The table-lifting operation is so efficient that it couldn’t be any easier: A worker moves the tables from their usage locations and wheels them onto the TLS platform. Jumping the tables to the next storey is done at the push of a button and takes only a few seconds. 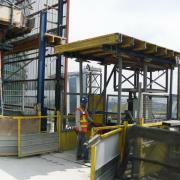 In the storey above, a second worker takes delivery of the tables and then – also using an electro-hydraulically powered shifting trolley – wheels them to their new usage locations. 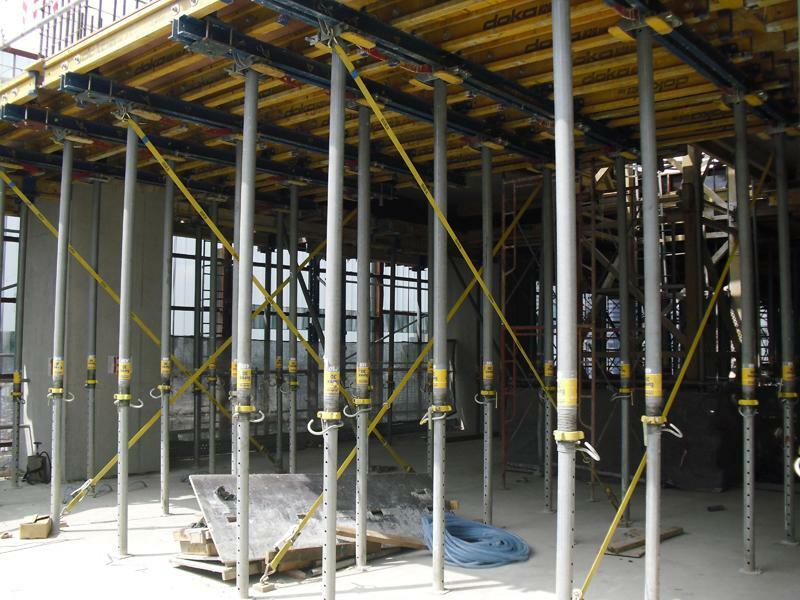 With this high-performing formwork and repositioning solution, the site crew are achieving a 1-day cycle for each storey. 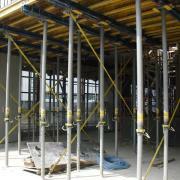 “Doka TLS system is a good solution. It helps to free out the crane for other activities and really speeds up our slab forming operations”, says Otaka Hiroyuki, Deputy Project Director of Kajima Overseas Asia Pte Ltd. 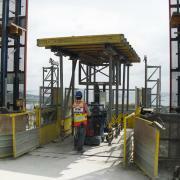 In terms of industrial safety, too, the TLS has a huge lead over crane lifts. 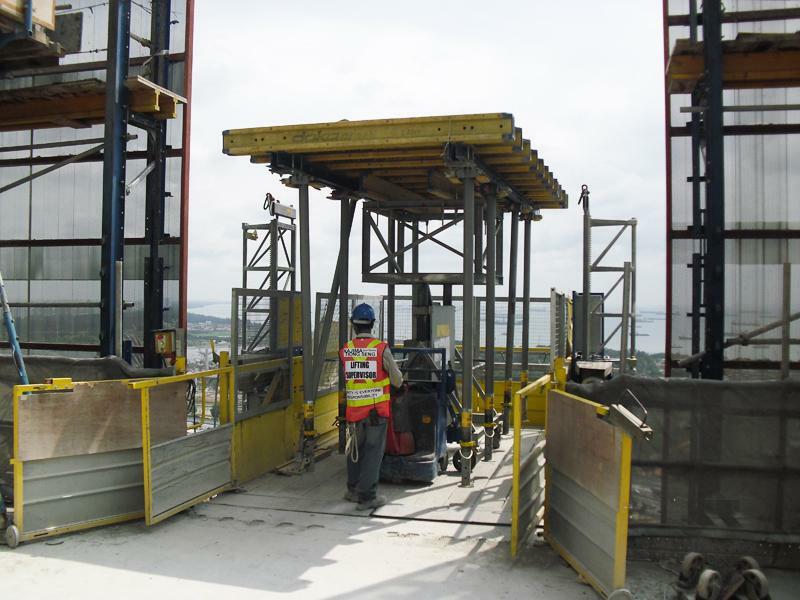 The Table Lifting System is permanently fixed to the structure, it incorporates a raft of active and passive safety features and can safely be used on high-rise builds when the wind is blowing strongly – in other words even after safety considerations have brought the site cranes to a halt. 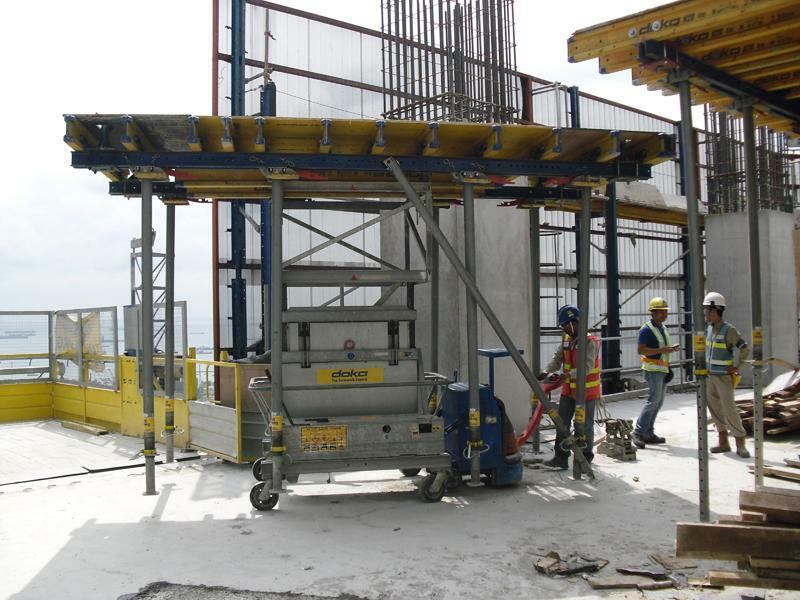 In order to ensure a safe working environment during the slab forming operations, the top four floors are constantly enclosed by a large protection screen Xclimb 60. It also protects the site crew from gusty winds and bad weather. 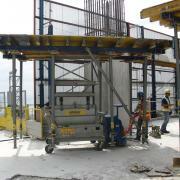 Furthermore this enclosure is hydraulically climbed to the top without any crane assistance. The climbing procedure is equally fast and efficient. 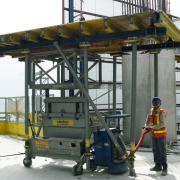 Mobile lightweight hydraulic cylinders push up the protection screens into the next level. 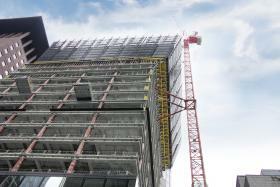 In combination with the TLS the crane capacity can be reduced to an absolute minimum at this construction sit. 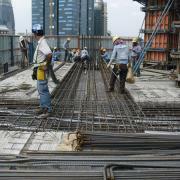 Thank you for your interest - Top-speed slab-forming without a crane. 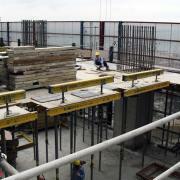 Thank you very much for your interest - Top-speed slab-forming without a crane.